This March, Victor Maisano and three of his friends, will start their journey on the Appalachian Trail. Since many of you started reading my blog during my own AT thru-hike, I thought you might enjoy following his blog at BackpackingAT.com. Victor and his friends will each be sharing their experiences through several social media outlets, like Facebook, Twitter, Google Plus, YouTube, Pintrest, and Instagram. Victor says, "I like to think of it as a true reality show." Every Appalachian Trail adventure is unique, so even though you might see or hear about some familiar places, I can assure you their story will be one that only they can tell. I met Victor through Twitter. He asked me a few questions about my experience on the Appalachian Trail and agreed to let me reply to them here. I was going to answer all four questions on one post, but I can't seem to keep my answers short. This may come as a surprise, but I love to ramble on and on about backpacking. Victor: What if we purchased food from large [online] retailers and have them delivered to us on the trail. Since we would be purchasing for 4 people, we could easily make the free shipping quota and get food at a lower cost than we would in a local town. Other than stating the obvious of not having a signal on some parts of the trail, what would be wrong with this idea? Me: If you don't mind the extra planning that comes with food drops, ordering online isn't a bad idea, and actually offers some benefits over the traditional mail drop. My short answer is that unless you have special dietary needs, medications, or are a vegetarian; mail drops on the AT are more hassle than they are worth. One of the greatest things about life on the AT, is the freedom you feel while living such a life. After a few weeks, you won’t know if it's a Monday or a Saturday, and most importantly, you won't care. It is a great feeling. It may not be the case with you, but I think it's safe to say not everyone will have many opportunities to experience something like this in their life. With mail drops, you never completely leave behind the world of schedules, deadlines, and logistics. The AT is unique, in that, if you're already familiar with backpacking, you don't have to do much planning at all. Once you have your ride to the approach trail figured out, you only need to make sure you have enough supplies to get you to your first town. By picking up your supplies in towns along the way, the simplicity and freedom you experience on the AT will be even more total and absolute. Basically, what I'm trying to say is, don't over-complicate it unnecessarily. First, based on your question, it sounds like you’re already familiar with some of the problems with food drops, but I’ll talk about those for anyone else reading, in order to highlight some of the advantages of ordering online. Even the 100-Mile Wilderness in Maine has a resupply opportunity about halfway through. As of 2013, White House Landing is operating and picking up hikers. Just follow the signs and blue blazes down a 0.9-mile side trail, blow the air horn, and someone will be by in a boat to pick you up. They are trying to sell the land, however, so if you’re reading this beyond 2013, you may want to call ahead to be sure they are still picking up hikers. So in other words, there are no locations on the AT where you will need to send a food drop. Why does anyone bother with them at all? If you don’t have special dietary or medical needs, in my opinion, there aren't many great arguments for dealing with mail drops on the AT. Some people do it because they make their own food, but the most common reasons for doing it have to do with saving money by avoiding small markets and convenience stores and avoiding areas with limited supplies. On the AT, I never had a problem finding enough supplies at a resupply point to get me to the next one. And if shipping costs are involved, they will cancel out most, if not all, of the cost savings. That is, unless you send fewer drops and carry a huge amount of food, but carrying a heavy pack comes with its own, fairly obvious, downsides. Also, if you buy food before your trip starts, you’ll eventually get tired of some or all of it. Believe it or not, there is a finite amount of times you’ll want to stare down at a pot full of Knorr Pasta Sides. It’s not easy eating enough calories on a long-distance hike. You will need as many as 5,000 to 6,000 calories per day to maintain your body weight. By buying food along the way, you’ll ensure you’re buying foods that you will want to eat. So, I don't think traditional mail drops are generally worth it. On the AT, if I was concerned about the next resupply being expensive or limited, I would buy a few extra things at a good resupply point, like a town with a giant supermarket, to reduce what I needed to buy at the next stop. And if you do manage to save a little money with mail drops, you have to ask if it's worth the hassle. I think simplifying your life out there has a value that far exceeds those meager savings. So back to your question, if you’re ordering online, you can avoid most of the downfalls with the traditional mail drop. Although, I have to say, I haven't actually tried this yet. The only online store that I could find that might make this work is Walmart.com. It seems most products are only sold in bulk, so this may not work if you're hiking alone, but it could save you money if splitting the food with a group. And as you said, you can get free 5-day shipping if you order at least $45 of their “home free” items, which is a significant enough number of products to get everything you need. This eliminates one of the big disadvantages. And since you’re buying food relatively close to the day you’ll be eating it, it's also less likely that you’ll be carrying things that you’re tired of eating. Also, make sure you only order items that have a long enough shelf life to stay fresh. The first concern I had wasn't about poor cell service, but this is a concern. It surprised me how frequently I had service with my Verizon phone on the AT, but web access will be less common. I’m not sure how much less, since I didn't have internet on my phone, but I wouldn't want to rely on it. That being said, it doesn't matter that much, because you already know you can resupply in towns within three days of wherever you are on the AT, so you don’t have to rely on it completely. And any place along the AT that allows you to send a mail drop will hold onto it for at least 30 days, even the Post Offices, so don’t be afraid to send things way out in front of you and consider placing more than one order when you do get service. One advantage of shipping a package to a post office, rather than a hostel or hotel, is having the ability to call and have it forwarded. Let's say, for whatever reason, you know you're not going to make it to that post office during business hours, but you don't want to wait around town until morning. Simply call them up and have it forwarded to the next post office along the trail. This can help alleviate that feeling of being rushed by a deadline. If something is shipped using First-Class or Priority with the USPS, they will forward it for free. Although, packages from Walmart.com, of the size we're talking about here, will likely be shipped with FedEx. That just means if you call to have it forwarded, you will have to pay the shipping cost when you arrive to pick up the package. The distances will be short, though, so it shouldn't be that expensive. Another potential issue is that since you will be shipping packages to addresses that are not the same as your credit card billing address, Walmart.com may withhold the shipment until the address can be verified. This is to prevent fraud. They may not do it every time, but it could delay a package. You can sidestep this problem by calling your credit card company beforehand and asking them to put a note on your account with the addresses you plan on shipping to. If you decide to ship to a business, such as a hostel, hotel, or outfitter, use the option to leave a "gift message" on the label whenever possible, so the receiver will know it’s a mail drop for an AT hiker. For example, you can write, “Please hold for AT hiker,” as your gift message. You could also add something like, “ETA: 07/20/13,” or whatever date is close to when you expect to pick up the package. I would add several days to that date, so you don't feel like you have to rush. 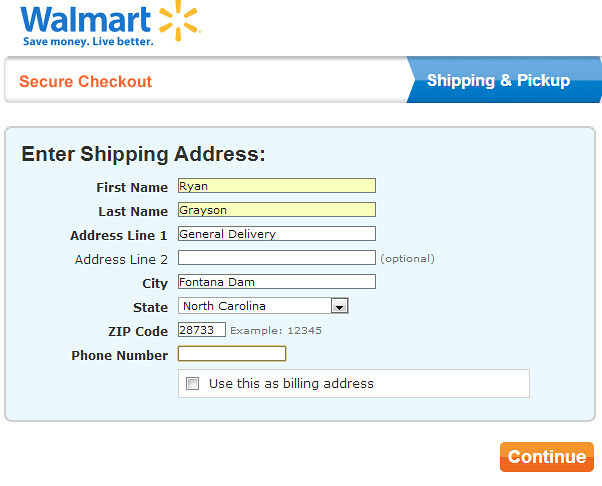 In some cases, Walmart.com won't give you the option to leave a gift message on the label. It depends on the product you're ordering, for some reason. Although, most places along the AT that accept mail drops will be very familiar with this practice and will probably assume it's for a hiker. For peace of mind, you could call and let them know you sent a package to them, so they will be expecting it. To avoid any shipping issues, I would still avoid mail drops as much as possible, in order to simplify your life on the AT, but ordering from Walmart.com doesn't sound like a bad idea at all. If you don't rely on it too much, send orders with plenty of lead time to correct issues, and use some of the tips above, I think you could do it without taking away from the experience. On other long distance hikes, such as the Pacific Crest Trail, where towns are more spread out and further from the trail, ordering online would be considerably more beneficial. I will keep that in mind while planning my 2014 PCT hike! Let me know if you try it and how it goes. There is still a chance that they will screw something up, since I'm sure they are not familiar with thru-hiking. I'll add an update to this post with what you find out. One last bit of advice when it comes to heading into town for a resupply, I recommend doing it often. Some people may frown on taking too many trips into town, but even though there are great benefits to being far away from the creature comforts of civilization, I'm a fan of frequent resupplies. The more times you stop to resupply, the lighter your pack will be. Even though a hitch in and out of town can take a few hours, you will be able to hike longer and further with your lighter pack and make up some of the difference. You will also have less pain, less injuries, more energy, and you'll just be happier overall. And besides, I found that most of the anecdotes, for your blog and for the stories you'll tell years from now, will come from those town visits. Alright, I need to stop before I ramble on even more. I'll post your next question and answer soon.